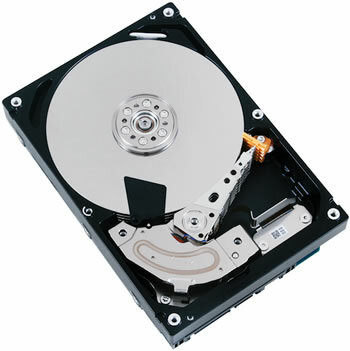 Following up on Western Digital's recent announcement, Toshiba has unveiled its own high-capacity MG series hard drives. To start, the company will offer four drives with a top capacity of 4TB, including two SATA variants, the MG03ACA400 and MG03ACA400Y, as well as two SAS models, the MG03SCA400 and MG03SCP400. Designed for RAID arrays, tiered virtual infrastructures, private cloud deployments and other such tasks, the updated five-platter drives offer twice the storage space as Toshiba's previous business-critical hard drives on top of boosting operating efficiency and increasing the speed sustained transfer rates by a healthy 18%. The drives have a 7200RPM spin rate, 4.17ms latency, 8.5ms/9.5ms read/write seek times, 165MB/s sustained transfer rate, a 64MiB buffer, 11.3W active/6.0W idle power draws, produce up to 31dB of noise, have a 1.2 million-hour mean time between failure, and are rated for 24/7 operation with a five-year warranty. Two of the models (the MG03ACA400Y and MG03SCP400) also offer near-instantaneous cryptographic data erasure to allow for quick and secure device retirement or redeployment. The SATA self-encrypting drive features the T13 Sanitize crypto-scramble and the T13 ATA Security Erase protocols, while the SAS variant is armed with T10 Sanitize and the Trusted Computing Group's enterprise protocols to securely wipe drives. Toshiba expects to ship samples of the 4TB MG drives by early next month with volume shipments due early next year, but pricing hasn't been revealed yet. For reference, Western Digital's three-platter 4TB 7200RPM WD4001FAEX is already available online for about $350, and while it also offers a five-year warranty, it's aimed at computer enthusiasts and not enterprise customers, who would be better served by the RE series.